I thought I would take a moment to show what’s in my to-read pile for this month. I am going to the beach the end of the month and I certainly need something to keep me busy. These are the books that I can’t wait to dive into while I’m soaking up sun and playing in the sand. 1. Beware a Scot’s Revenge by Sabrina Jeffries – I am so excited to read this one because it is part of her School for Heiresses Series. I have loved the first two books in the series and know this one will be no different. Sabrina has a lot of new books out that I got while in Vegas for the RT Booklovers Convention. Those are also in my other piles to read. However, I like to be different and read some of the older works first. This is a great one to start with if you are into reading some historical romance. 2. Rising Sun by Ava Vixion – This is the sequel to Darkest Before Dawn. I am really excited to see what happens next in the League of Guardians Series. I am also happy to announce that the third book in the series is coming out in September! I may or may not have an ARC of Crystalline Dreams, the third in the series, waiting to be read on my Kindle if I finish this baby at the beach. 3. 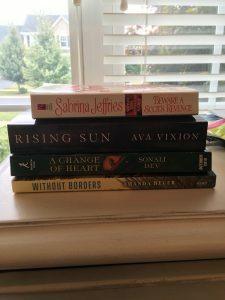 A Change of Heart by Sonali Dev – I got this ARC copy at the RT Booklovers Convention in Vegas from Sonali Dev. I was told that I would LOVE her books. So I am going to pick up her other two books at the library but thoroughly enjoy this at the beach. The cover is absolutely gorgeous and the book will officially be released in September. 4. Without Borders by Amanda Heger – This is another book from RT. I loved meeting Amanada this book I am really excited to read. The next book in the series is due out in November, so I better get reading. Also I really think this will be a great read for the summer.